Would an Irish Derby ‘Judgement Day’ work for us? Once upon a time, there was a thing called the Inter Provincial Championship. Munster, Leinster, Ulster, and Connacht faced each other to be crowned kings of the amateur era in Irish rugby. That began back in the 1920s, long before there was a Celtic league to speak of. Since the league kicked off, the Irish Provincial derbies have been integrated into the regular league season. There’s always an extra bit of bite to those fixtures, the presence of a bigger European prize at stake hasn’t taken away from the desire of beating your neighbours. There are a total of ten Irish derbies in the league each year, the same as the Welsh. However, the Welsh do things just a little bit differently. Judgement day. That’s not an attempt at making this article topical by making vague reference to the Terminator series, it’s the name of a big day in Welsh rugby. The day the Welsh sides battle in the Millennium stadium. Since the 12/13 season, we’ve had a double-header of Welsh derbies on the one day. The fixtures have rotated each season, Newport Gwent Dragons and the Cardiff Blues play either Scarlets or Ospreys each year, in the countries national stadium. Last season 52,762 people turned out for both games, which is a Pro12 record for any fixtures. Judgement days been a success so far and looks set to continue. It’s a day to celebrate the rivalries, and Welsh rugby. It’s a good idea, one that could help pay off the Aviva Stadium. The Aviva Stadium has been Leinster's supposed ‘big home game’ stadium for the last few seasons, but really it’s the national stadium. In fact, really it’s Lansdowne Road sponsored by Aviva. It’s taken some time but now after some big wins on the international stage, it’s become the home of Irish rugby. Why not celebrate that every season. It’s always felt a little bit phony to call the Aviva Leinster's home ground. The RDS is Leinster's home; the Aviva is where they play games where the ticket sales are expected to be really high. I’d always rather sit in a packed RDS for a home game than a half-full Aviva. 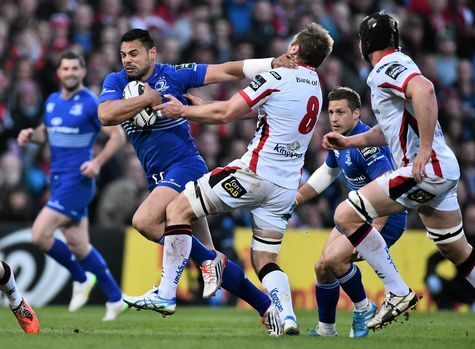 Leinster play Munster in one of their supposed home games every season, why not bring Ulster and Connacht along? I don’t see why Leinster – Ulster is not a big enough game to have in the big game stadium, and with Connacht becoming more competitive they deserve to be there too. The first Leinster could face Ulster and Connacht could face Munster, with a different pair of matches taking place the following season. Sometime early in the season, when it hasn’t really got going yet and before the European tournaments start, a day like this could really kick-start the season for the Irish sides. Having a day of Irish derbies in the national stadium would spice up the opposite of the business end of the season, (personal end of the season?). One of the problem with this arrangement is someone’s going to lose one of their home games. I do see the problem in asking Ulster, Connacht, and Munster supporters to come down to Dublin to watch their team play what should be a home game. Leinster – Munster is a big enough game to bring the away fans down, but Connacht – Ulster may not be. Unfortunately, the Aviva has been earmarked as Leinster's second home ground, and there is admittedly too much unfairness around asking only the other provinces to give up a home game. But isn’t there another huge stadium that will hopefully be seeing a lot of rugby in 2023. Croke Park would work perfectly as a neutral venue. Yes, Leinster would have to travel the shortest distance, but there would not be the sense of familiarity. Croke Park has long been the site where people from all counties come up for a great day out. In recent years the counties of all four provinces have been well supported in the final stages of the All-Irelands, the venue brings with it a sense of occasion. Croke Park will always have John Hayes’s tears and the memory of Shaggy catching that cross-field kick to touchdown against England, seeing the provinces battle there would add more memories to the great stadium. Maybe the idea of a fixed stadium just won’t work in this scenario. But there is no reason why the venue can’t rotate as well as the fixtures. One year it’s in the Kingspan, the next it’s in Thomond, the next it’s in the Sportsground. That would keep it fresh as well, the idea of travelling up to Belfast to watch Leinster – Munster, or going to Limerick to see Connacht take on Ulster would be novel. One or two teams would have to sacrifice a home game each season, but this could be compensated by receiving extra tickets for the game. The ‘Judgement Day’ concept is one that would be enjoyable to watch if it was implemented for the Irish provinces, but ultimately, it may be unnecessary. This is an idea that worked for the Welsh because of the circumstances of the game there. It had long been the problem for the Welsh that the intensity they played at on the International stage would not translate over to provincial competition. A yearly event like Judgement day really helps emphasise the importance of the fixtures. There hasn’t been that problem in Irish rugby in recent time, so changing things may prove to be an annoyance and more damaging in the long run. I suppose we don’t have to jump on every sporting bandwagon. The inter-provincial fixtures that take place around New Years is a tradition I’ve always personally enjoyed, and one that suits the identity of Irish rugby. If attendances ever begin to dwindle at the games between provinces, we could see this approach adopted by the IRFU. And if this ever was to happen, I demand that the day be christened, ‘The Shamrockalypse’.